Ever since Defiance officially went live on Tuesday, I’ve been playing Trion’s new MMO third-person shooter every night for approximately 1-2 hours each session. Granted, that’s probably optimal for me, given my hopes that this game can become a fun and casual pastime on the side. Still, I’m sure I’ll need a lot more time with it before I’m comfortable with forming more solid opinions. However, I’m happy to say that so far all my experiences have generally been positive. Even spending just mere minutes with the live version erased a lot of my previous misgivings, given that I was in the alpha and the beta…and let’s just say it hasn’t always been pretty. In light of some of the more persisting issues, I even occasionally had my doubts about my pre-order. For one thing, I’ve always wondered to myself, “Can you imagine how stupidly fun this game would be when grouping with friends?” I envisioned a lot of running together as a squad with my guild, but alas I was never able to get the friend and group invite working for me properly during testing. So you can imagine my excitement and relief when I fired up the live client on Tuesday night to find the grouping system working flawlessly. That one thing probably increased my love for Defiance tenfold. I mean, how surprising that a broken grouping system in an online multiplayer game can completely cripple your enjoyment! Who’d have thunk it, right?! Sure, you don’t absolutely need to group in Defiance, but I definitely experienced a whole different layer of gameplay dynamics after a few hours running with my husband. There’s an added immersion you just don’t get when playing alone or out-of-communication with others; playing the game is so much more interactive when I find myself planning out attacks with someone else, whether it’s splitting up the work during missions or laying down cover fire when the other player is interacting with a quest object (or running like hell for his life). Last night, I even had the chance to participate in one of those big Arkfall events. Now, ain’t that a whole different kind of animal. It’s very similar to the rift events in Rift that happen very randomly and without warning. One moment, a small group of us were just la-di-da shooting away, and then all of a sudden you’re swept up in a massive crowd like a wave and flaming hellcrabs are jumping at you trying to eat your face and your poor mouse is just gripped in your sweaty shaking hand while you’re desperately firing that assault rifle like it’s nobody’s business and…it’s just one big mess. The good kind of big mess. That’s the thing. 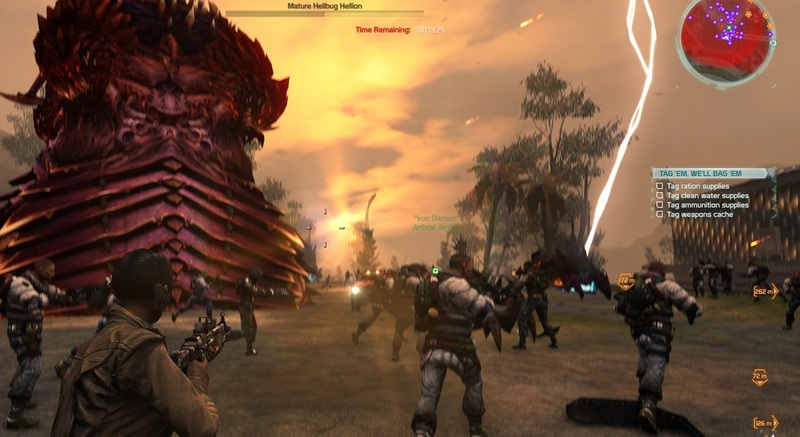 I’m still not entirely sure how I feel about Defiance, other than it’s rather fun and addicting. But if there’s one aspect that really surprised me about the game, it’s how quickly I took to it. I’ll admit I’m not the biggest fan of shooters, I honestly never thought I would get into a game like this. That I did and got hooked onto it so quickly speaks volumes about it, I think. Haha, no I’m not the biggest fan of shooters. If I do play them, it’s only occasionally and only certain titles. I usually stay even further away from MMO shooters because so many of them are PvP centric. But one of the first things that struck me about Defiance even during beta was how much PvE content there was, which was another aspect I liked about the game. Oh no, I heard issues about that 😦 Hope it’s all fixed now. I’ll have to update myself, I’m sure there’s been a new patch since I went out of town on my trip this past weekend. Well, we finally got the patch downloaded! 🙂 Took all of the day, but it’s there. I’ll have to look at giving it a go tonight. Hubby and I are going to share an account until we decide whether we like it or not – then we’ll get another copy for each of us to play. If I understood the concept correctly, Defiance have public quests… like Rift and GW2. Yep, there sure is. Some are just there, popping up over and over again, and others are like the Rift events. I believe Arkfall is what Defiance calls them, the events “rain down” onto the planet. I’m so glad that Defiance seems to be doing so well! I was beta testing and that other testing I’m not supposed to mention for over two months prior to launch and honestly I had my doubts… enough that I neither pre-ordered or bought the game at launch, but now I feel like I can make the plunge with fewer regrets! Oh, I know exactly where you’re coming from. I was in the alpha and beta as well and like I said there were times when I seriously reconsidered my preorder! I spent a chunk of last week out of town so I haven’t been able to play as much as I’d like, but people I know seem to be really digging it and enjoying themselves! It’s probably best that you took a few days out then. IMO the game’s still late beta quality, and should be completely smoothed out by the end of the month. Trion was really behind the 8 ball on this one, especially since they were riding on someone else’s deadline this time, which you could kind of tell by their rather short alpha/beta cycle. Yeah, I also thought that it was unlike Trion, but you’re right, the looming deadlines probably had a lot to do with it.